Bloomington city officials presented ideas to shore up a projected $2.9M budget deficit for FY2019 at the council regular session meeting, 7:00 p.m. Monday at City Hall. 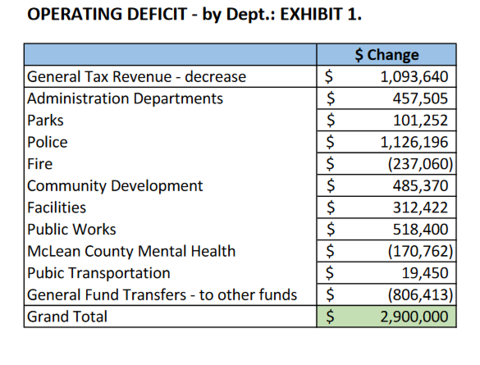 Interim City Manager Steve Rasmussen outlined a possible budget scenario, which included cutting services and generating new revenue to make up the deficit. Department heads were on hand to present additional details and answer questions. Discussion among aldermen centered largely on solid waste collection. Bloomington Director of Public Works Jim Karch presented reduced brush and bulk waste collection, increased collection fees and staff reduction by attrition as options to recoup the $1.1M lost on the service. Aldermen asked Rasmussen to recommend a resolution to explore privatizing the city’s solid waste collection service at the next council meeting. Encouraging city departments to track unspent funding to make further cuts. Rasmussen stressed the presentation was not a budget proposal but a potential starting point toward a balanced budget. Rasmussen also gave an overview of capital projects identified in the City’s Capital Improvements plan with possible funding sources. Bloomington Lodge No. 43 Ancient Free and Accepted Masons for the Restoration of 302 E. Jefferson St.
Diana Krieg and Dawn Peters for the landscape restoration of 409 E. Grove St.
Ward 1 Alderman Jamie Mathy and Ward 8 Alderman Diana Hauman will host a Town Hall from 5:30-7 p.m. Tuesday, January 23, at the Breckenridge HOA Clubhouse, 1001 White Eagle Road, Bloomington, to discuss the FY2019 budget and other issues. Aldermen will continue to discuss the budget as well as the search for a permanent city manager at the next council meeting February 12. Rasmussen said he expects to present a budget proposal at the February 26 council meeting. A public hearing on the proposed budget is set for March 12. The City legally must adopt a budget by fiscal year’s end on April 30, although Rasmussen said he anticipates that will happen April 9 or 23.